Microsoft at its October 2nd event announced the new Surface Pro 6 and Surface Laptop 2 in black. The devices are now available for purchase in select markets starting today. Both the devices come with an 8th gen quad-core Intel processors to boost the performance of the devices. However, as was expected both the devices don’t come with the USB-C port. The Surface Pro 6 supports up to 13.5 hours of battery life and comes with an Intel Core i5 processor, 8GB of RAM and 128GB of storage. Microsoft has priced the device at $899.00. If you are looking to buy the black variant then you would need to choose the model with 256 GB SSD and has been priced at $1,199. Microsoft has made minor changes to the keyboard and thermal system of the Surface Pro 6 and Surface Laptop 2. 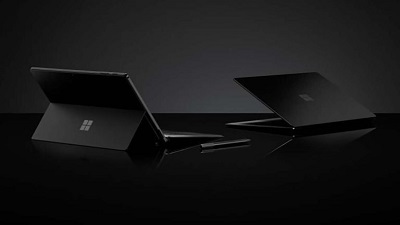 Microsoft is selling the Black version of the Surface Pro 6 and Surface Laptop 2 along with the existing Platinum, Burgundy, and Cobalt Blue. The Surface Laptop 2 comes with the new Intel Core 8th Gen processors with i5 and i7. The devices are paired with Intel UHD Graphics 620 card. The Surface Laptop 2 comes in two variants of 8GB and 16GB of RAM and you can expand the storage up to 1TB. However the Surface Laptop 2 doesn’t come with the USB-C but Microsoft has left the connectivity options similar to the 1st generation which means that users will be getting one USB 3.0 port, a Mini DisplayPort and a Surface Connect Port. We have all the necessary links posted on OUR FORUM.